Small- and medium-sized business (SMBs) are under a lot of pressure to succeed and grow. Increasingly, many of them are turning to the Cloud for services that provide greater flexibility, better collaboration, improved productivity and IT services, and ultimately reduced costs. 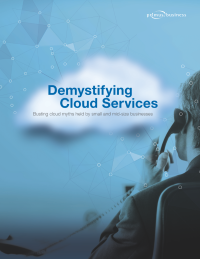 Download this white paper to learn about a recent study conducted by Leger on behalf of Primus Telecommunications to learn about the benefits that SMBs are realizing and why more and more companies are adopting cloud services. According to a recent study conducted by Leger on behalf of Primus Telecommunications, 69 per cent of IT decision-makers at companies with less than 100 employees believe it’s harder for small businesses to grow, citing various factors as contributing to an uneven playing field. These include: government policies designed to better support large enterprises; being behind in technology adoption; and, lack of access to best-in-class technology.